» Albany postmaster: Move? Why? 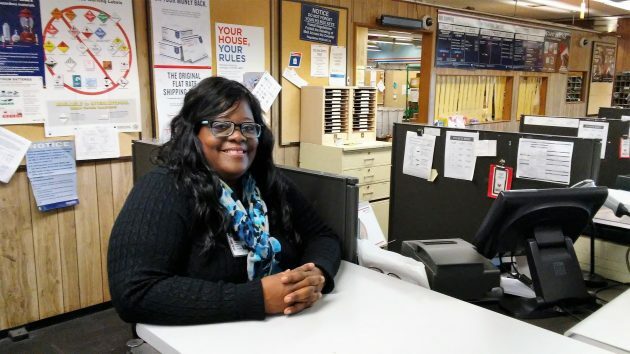 Postmaster Pamela Moody at the Albany Post Office on Monday morning. She sees no reason why the office should move. Pamela Moody, 55, assumed the postmaster’s job in April. She joined the Postal Service after serving in the Army in posts all over the country as well as Germany and Korea. Her previous assignment as postmaster was in Seminole, Texas. I stopped by last week to meet her and ask her about the notion that the Albany office might be persuaded to move from the downtown block it has occupied since 1963. A work group formed by Mayor Sharon Konopa has been discussing other possible locations for the post office. After the group’s meeting a week ago, city officials said they would work up proposals involving two sites that could then be presented to the United States Postal Service. In my conversation with Moody, she stressed that any such proposal would have to be considered not by her but by higher-ups in the Postal Service, at the district level or higher. It would involve various committees and feasibility studies and would take all kinds of time. But really, she wondered, why would her agency even consider such a proposal when it owns its Albany building and, on the national level, is not looking to incur additional and needless expense. What if, I asked her, the city or somebody acquired a new site, built an office and turned it over to the Postal Service at no expense to the service, as unlikely as that sounds? That just would not happen, she thought, and even then it might not make sense for the office to move. All the postal routes in the Albany area are arranged to be served out of the present building and would have to be reconfigured, apparently not a simple thing. The need for additional parking downtown seems to be driving the mayor’s idea, especially once the Albany Carousel opens this summer across First Avenue from the postal block. The postmaster suggested the city might look at other properties downtown if it wants to provide more off-street parking. And anyway, she wondered, did anybody consider the need for parking when the carousel’s site plan was approved? I was surprised to learn that nobody from the city had been in touch with Moody during the month she has been on the job. The mayor has said she wanted to wait until she had a proposal to present. But you’d think the work group might have reached out to the person in charge of a property whose possible move had been the subject of several public meetings. It is time for a move. Trying to improve downtown it could become a,parking lot for the carousel, river rythyms etc. Sell the lot to the city and use the money for new digs. Maybe use the building on Pacific and queen, the old safeway building. I agree with Pamela Moody! 110%! The city jnew the parking issues when approving the carousel sight. Backasward to say the least. One possible solution. A win-win. CARA strikes a deal with USPS and builds a 10-story parking garage above the existing Post Office building. Imagine the revenue stream. Perhaps a Base-Jumping vendor working the 10th floor. The parking ramp is better even than marijuana taxes. ANd, given CARA’s remarkable record laundering cash for downtown-oriented projects, it only makes sense that CARA, Albany’s preferred provider, would take the lead. Mr. Hering…can we count on your influence to get the ramp up and running? Amazon is going to save the USPS, time that they recognize that and get with the times. I am in 100% agreement here. And I do not want to see any Albany tax money used to buy another location and force this issue. The USPS does a wonderful job in our town. I support them mainly by still paying most of my bills using checks and a stamp. But I also support them by receiving many packages : clothes, books, coffee, well over a hundred a year. FedEX and UPS also do well, but not better than the USPS. I hope they stay downtown, the heart of Albany forever. On another note, I wondered about the title ‘postmaster’, particularly with reference to a woman, and found this interesting article on the term at the USPS site.